Every collector has his or her show-off piece. For some it’s a piece with the most sentimental value. For others it’s their most rare and valuable item. For me, it’s a bit of both. Police Sunstreaker is my personal Holy Grail that I had been hunting for a while, and I was lucky enough to get my hands on one – even if it isn’t nearly as rare as other pieces out there. Interesting how pre-Skids is the only figure missing its toy photos, presumably because it was still in development. Police Streaker truly pops out of this lineup. The sticker designs have a 70’s appeal. I almost wish it said “Disco Robo”. Oddly, the white stickers aren’t true white, which makes him look like he has dirty shoulders. These are getting a little discolored over time, but I wouldn’t put them on him anyway. On with the show! This is the most expensive cop car I’ve seen. These pics don’t do this piece justice. Side view looking svelte. They did a great job modifying the hood molds for pre-Sideswipe and pre-Sunstreaker. Snazzy look with the afterburners on. I always loved how his arms folded neatly to form the back of the car. Love that Japanese Police insignia. Just wish the sticker were on perfectly. But the rest is in pretty great shape, so I’ll just shut up now. Who’s that under the hood? Poor post-Diaclone toy owners, missing their little drivers. 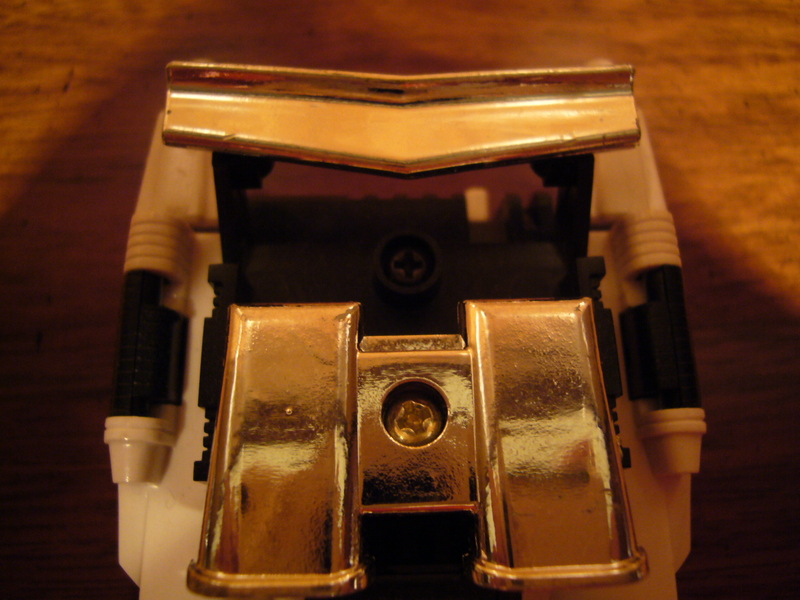 Since I had owned a Diakron Sunstreaker as a kid, I always hoped that Transformers would come with these little guys. But alas, CHOKING HAZARD. Yo! I just carjacked this ride! I’d let you hop in but it only seats one. Doh! Locked my keys in the car again. The bot form in all its magnificent, pearly white glory. It’s got on SPF 500. Please, Sun, don’t discolor me now! The red eyes give him a menacing look, as is he were pulling an all-nighter. Always loved Sunstreaker’s head sculpt – it’s got that 70’s Egyptian retro-future god vibe. With his little Diaclone driver for scale. I like how they kept the Diaclone figures consistent in scale with the pilots. Go Team matching outfits yay! Hehe. I feel this pilot should come with a tophat and a cane to complete the look. Originally, I was looking for a Diakron DK-1 Red Pre-Sunstreaker, to recollect an old toy from my youth. “Red” had come out on shelves at our local department store, Best, a little while before Hasbro released its inaugural G1 line in 1984, and I was lucky enough and scored good grades in order to score one. In the hands of a little seven year old, unfortunately, Car Robo didn’t last that long, and my only real memories of that red sports car were those of its worn-out chrome engine and spoilers. Oh how this chrome sparkles so… The plastic underneath the chrome on this one is white too, unlike some other Police Streakers, which are sometimes red instead. Re-using those DK-1 spoilers, eh? But even as a child, I knew that there was something fishy when my local toy shop carried Kingdam Microchange knockoffs BEFORE Transformers came out. So when I discovered that there were, in fact, alternate versions to the toys that would be released as Transformers, I was thrilled to discover the Police Sunstreaker mould. (Learn all about its history from Maz here.) Thus began my pre-Transformers awakening and subsequent adult fascination with Diaclones. 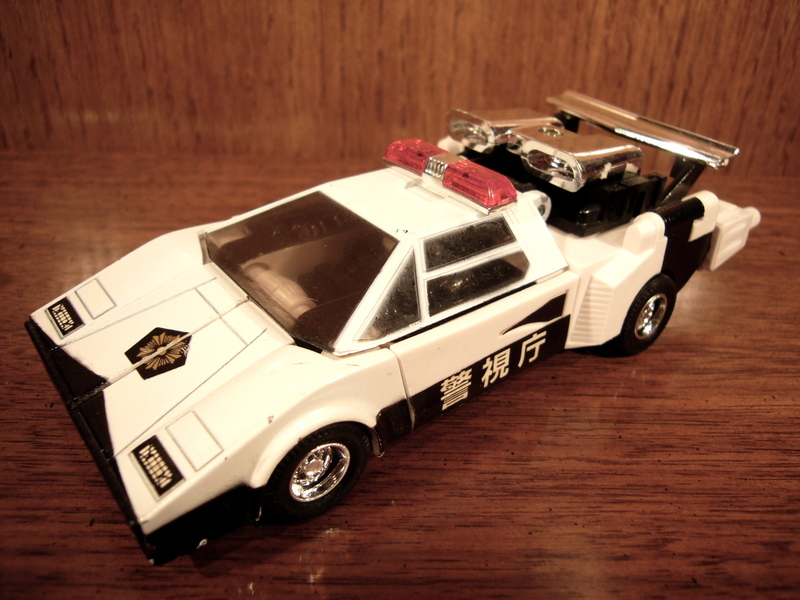 For me, Police Sunstreaker represents the ultimate consummation of pre-Transformers archaeology and nostalgic keepsake. It has made me a very happy boy and curbs my appetite for collecting other unnecessary plastic! Sorry for the very late response! (I haven’t been able to update my blog for a while.) Cool video reviews you’ve got there. Nice score on the clear Astrotrain. Shoot me an email if you have any questions about this or other Diaclones… Thanks for the note!